San Francisco is such an amazing experience to explore, from its amazing history, its beautiful parklands and of course, its delicious food! The city itself is one of our favourite places to visit in California and a must-see for anyone wanting to experience the charm and buzz of a west-coast city. I recently travelled for an epic 4 months across the dramatic expanses of the US, seeing some magnificent places, meeting new people and eating lots of delicious food! I decided to let me travels guide themselves so to speak – using the roads as my direction I managed to cross a whole range of beautiful states in the United States and Canada providing me with an experience I will never forget. There’s a whole array of different cities to experience in the United States, from the secret spots to see in New York City with Lady Liberty herself to the north eastern historic cities of Boston, where you can visit Harvard and eat some delicious lobster caught fresh from the bay! Further south, beach front cities such as Miami with its art-deco style architecture, beautiful beach and Cuban influence provide a completely different perspective that any traveller should experience. With such diverse cities in mind, it was difficult to know where to start and even end my trip across the United States, but start it must – in the beautiful city of San Francisco. I have to say, the city itself is spectacular, with so many things to see and do it became hard to even want to leave! See Also: Have You Ever Heard Of Salvation Mountain in California? San Francisco is perched right on a peninsula on the Pacific Ocean therefore it can get a little foggy, with a climate that can change as quickly as a snap of a finger! Spend a week in San Francisco and I’ve no doubt you’ll experience every weather system known to man! Pack a raincoat, some sunblock and prepare for a surprise! There are so many places that every visitor must see in San Francisco, from the awesome Golden Gate Bridge that every visitor should walk across (and maybe Uber back) ;-), to the infamous prison island of Alcatraz, which can now be visited without having to commit a crime! Jut like Ellis Island in New York City, Angel Island near San Francisco became an immigrants port of entry for many east Asians migrating to the United States. With this mix of cultures has come one of the biggest China Towns in the world – it’s a great place to experience some traditional cuisine and even enjoy fusion food that is now mixed with locally produced Californian products. Yum! 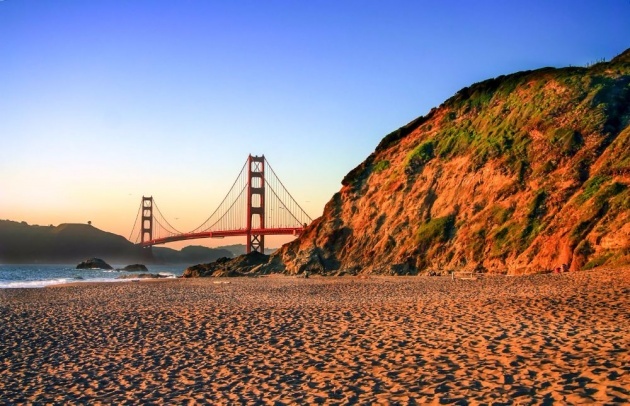 If you’re looking to burn off some of those calories from your delicious Asian cuisine, take a wander across Golden Gate Park and stroll towards the culturally diverse Haight Street and Lands End at the ocean side. It’s a great area of the city to explore the multiculturalism, diversity and charm that San Francisco offers its residents and visitors. There are so many areas of the city to explore, each with its distinct character that truly embraces difference! See Also: The Ultimate California Road Trip: 19 Places To Stop, Eat, See and Explore! My favourite parts of the city was The Mission which is predominately influenced by Mexican heritage and culture. Cool bars, delicious restaurants and calorifically good street food is a must for a ‘hungry hippo’ like me. As the week ends and the weekend begins the city relaxes and really embraces its laid back image. On Saturdays when the weather allows, try some of the cities artisan alcoholic treats such as BigDaddy IPA´s from Speakeasy, or the deliciously moorish Hell or High Watermelon beer from 21st Amendment Brewery that will blow your mind! Who’d have thought you could make beer with watermelon?!? No visit to The Mission would be complete without a super-sized burrito from Pancho Villa Taqueria (that offers you the opportunity to test you spiciness threshold) and a walk through Dolores Park. If your venturing across Broadway (in San Francisco, NOT New York City), don’t forget to check out Sam´s (618 Broadway). Conjure up a strong appetite and try one of the world’s best burgers! What I loved most about Sam’s is its ability to offer really delicious burgers that are created just for you. Choose what you like from the thousands of combinations and eat in one of the cities local eating points that has been feeding the city since the 1960’s. I had the amazing opportunity to stay with one of my closest friends in Richmond. He moved all the way from Denver, Colorado to follow his dream career of working in fine dinning, landing himself an amazing opportunity at a double Michelin Star restaurant, Quince in downtown San Francisco. If you are heading to Richmond, don’t forget to try some local cuisine in the likes of Hot Sauce and Panko (1545 Clement Street), Halu (312 8th Avenue) and Burma Superstar (309 Clement Street) – all delicious and inexpensive eateries that will leave you full for days! ;-). Oh yes, don’t forget to try some delicious Clam chowder from the waterfront! I fell in love with San Francisco and it was great to see so much of the city from a locals perspective. I think that’s one of the benefits of living like a local – becoming absorbed in the cities way of life, the ‘hidden’ attractions and meeting so many locals that are seem to be always smiling. As you’ve probably guessed, my greatest pleasure is eating! Eating out, eating in… just plain eating and San Francisco has so many opportunities to make your taste buds tingle.